YOU Magazine - January 2007 - 212 Degrees: Inspiration at Its Boiling Point Subscribe to YOU Magazine and other timely market alerts from Laurie Gardner. 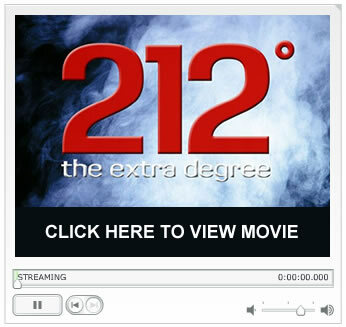 Based on the mega-hit book by Sam Parker and Mac Anderson, the short film 212° The Extra Degree has become a true phenomenon in the business world. Interestingly, the film offers no expert economic advice or best business practices. It reveals no code-cracking, money-making secrets or pragmatic platitudes. Instead, it serves up an inspiring and memorable metaphor of action, persistence, and potential that grabs hold of the viewer and won't let go. The concept is simple. At 211 degrees, water is extremely hot. At 212 degrees, however, water begins to boil. With boiling water comes steam, and with steam comes enough power to fuel an engine, a locomotive � even a ship! That extra degree, that extra effort, is the difference between being great and just being good. It's an amazing concept that everyone can appreciate and relate to on many levels. After all, the difference between a gold and silver medal performance is often a mere fraction of a second. For Sam Parker and Mac Anderson, the most fundamental principle of success boils down to that one degree; that extra something that unlocks potential and opens the door to achievement beyond all expectation. YOU Magazine is pleased to present 212° The Extra Degree, a short film produced by Simple Truths, a consumer-direct publisher of motivational books and films. Visit www.simpletruths.com to learn more about this unique company.